This textbook is primarily intended for students of History and Anthropology and it represents a valuable resource for an ESP/academic course. It is geared towards improving students' knowledge of English grammar and syntax and expanding their vocabulary while developing both their receptive and productive skills. The textbook is divided into six widely conceived thematic modules comprising carefully selected texts. The relevant thematic context of the book appropriately motivates students to engage in discussions and freely express their views and ideas on a range of different issues while the creative and engaging tasks accompanying the texts trigger the curiosity of readers prompting them to further delve into the subject. This remarkable textbook based on recent trends in ESP methodology is the result of the author's extensive experience in teaching academic English at the Faculty of Philosophy. Although primarily written for students of History and Anthropology, this book provides effective teaching material for degree students in related studies. Each unit of this textbook is a challenge into which the author lures its readers by knowledgeably using varied motivational strategies ... Every page in this manuscript is meticulously composed, endowed with clarity, simplicity and refinement. Nina Vlahović has been teaching English at Belgrade University since 1991. She has written a number of papers in sociolingustics and applied linguistics, and two books on English grammar (English Grammar Exercises and English Grammar in Context). 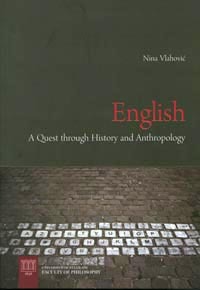 Nina Vlahović currently teaches English to students of History, Anthropology and the Classics at the Faculty of Philosophy, Belgrade University.